Episode 55 has a decidedly Scottish flavour. 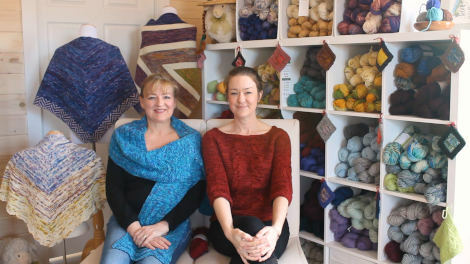 U.K. Knitwear designer Di Gilpin is our feature interview guest. 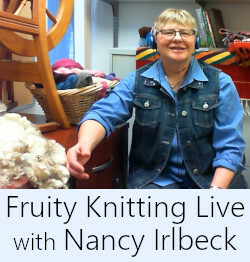 Di has had a fascinating and diverse career within the knitwear industry. She started in a small studio, on the island of Skye in the Hebrides, designing bespoke garments on commission and has ended up having her designs on the catwalk and published in Vogue Fashion. Our new segment ‘Meet the Shepherdess’ showcases Fleece and Harmony. 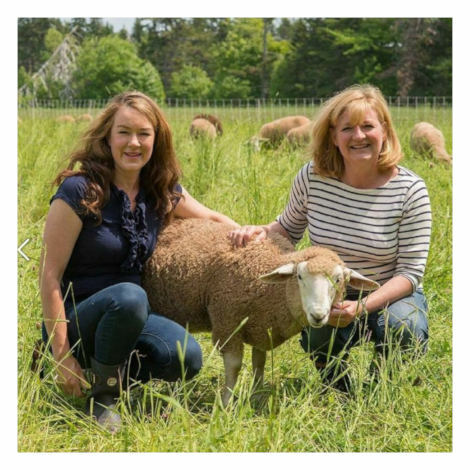 Kim and Jennifer, two sisters, left the corporate world and city life to raise sheep on a farm and with their mini mill they produce yarn from the fleece of their own and neighboring farms flock. The sister’s are originally from Nova Scotia (this is the Scottish connection). Andrea gives us a tour through Alice Starmore‘s beautiful book Glamourie, which is inspired by the local traditional stories of magical shape shifting animals in the Outer Hebrides. We take you on a short hike to the magnificent coast line at Muckle Roe on the west coast of Shetland and update you on the progress of our own projects. Di has had an extremely interesting career full of contrasts. 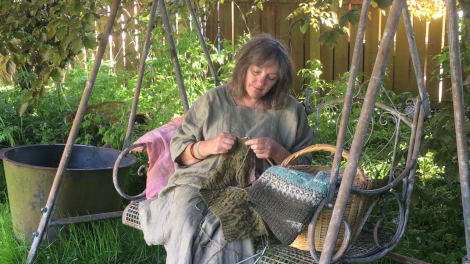 For 18 years she lived very remotely on the Hebridean Isle of Skye, working with local craftspeople and knitting on commission. She has also spent time in Spain and trekked through the Himalayan Mountains visiting monasteries. In contrast to that carefree and simple lifestyle, Di has also worked under high pressure with major fashion houses, creating hand knitted couture collections for the catwalk. 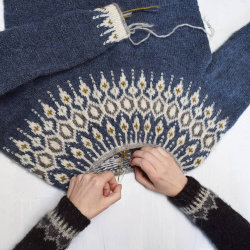 In the interview Di also talks about the research project she organised, collecting the original patterns and stories of the Gansey along the Scottish coast line. This project is documented on the Moray Firth Gansey Project website. 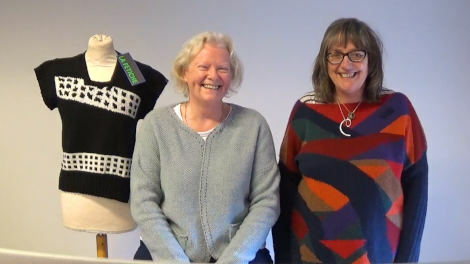 We also meet Sheila Greenwell who trains and organises the 30 highly skilled knitters in Di’s studio where they continue to work in collaboration with top fashion houses. 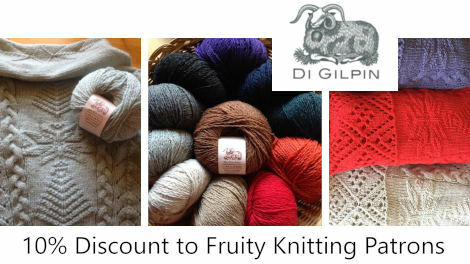 Di is offering Fruity Knitting patrons a 10% discount off all her yarns, kits and patterns in her online store which is fantastic! Kim and Jennifer are two courageous and hard working women. What an adventure to leave the city, buy a farm to raise sheep and then a mini mill to produce locally sourced yarn. 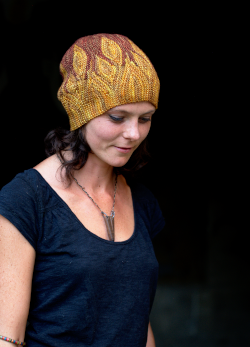 Their yarn is 100% untreated Prince Edward Island wool, gently processed, and then hand dyed by Jennifer in a range of Island inspired colours using GOTS certified organic dyes. Did we mention it’s the home of Anne of Green Gables? You might find some of the infamous Raspberry Cordial! 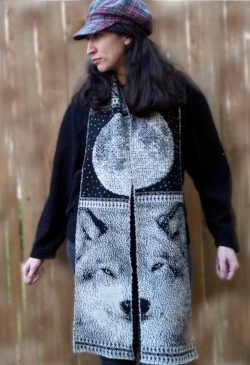 Kim and Jennifer are offering Fruity Knitting Patrons a 15% discount off everything in their online store. 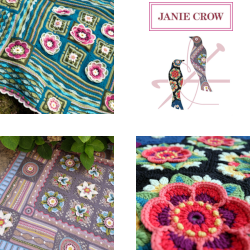 In their store you will find their complete range of yarns as well as a few patterns, some notions and some yarn related pottery. 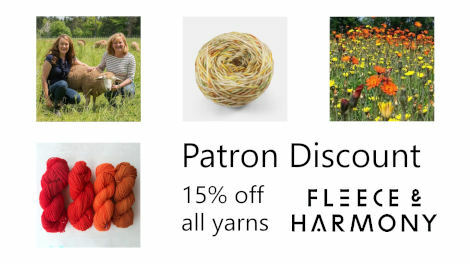 Patron discount from Fleece & Harmony! Glamourie is a Scottish word that means a charmed condition where everything has magical properties and possibilities. Alice Starmore and her daughter Jade Starmore live on the island of Lewis which is part of the Outer Hebrides. Lewis has an extremely remote, rugged and beautiful landscape where there is a strong tradition of magical stories of animals shape shifting into humans. 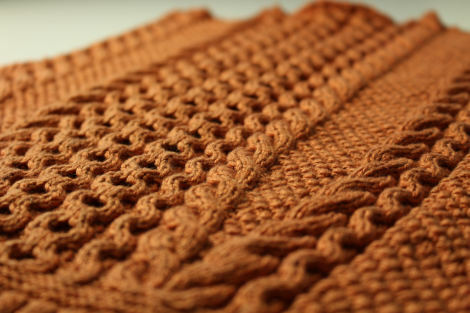 This is the inspiration behind this knitwear collection. 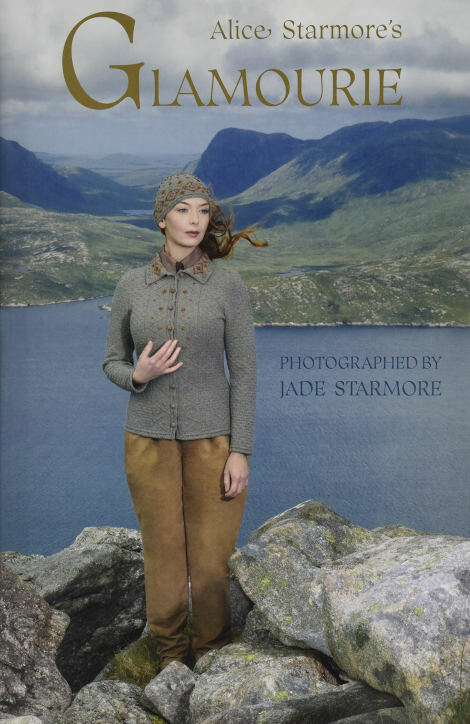 The book is a collection of tales, written by Jade Starmore, which inspire the costumes which in turn inspire the final 11 wearable garment patterns. The book is showing you how Alice’s mind works as an artist and her designing process. The photography taken by Jade Starmore is simply gorgeous. The costumes and designs are all taken outside in front of beautiful but simple landscapes that perfectly complement the designs, without taking attention away from them. The book serves a a spark to your imagination, giving you an insight into the creative process and showing you the high artistic and couture possibilities of hand knitting. If you are a designer or want to be inspired by the extreme end possibilities of hand knitting, then this is a must have. I also think every library should have a copy! 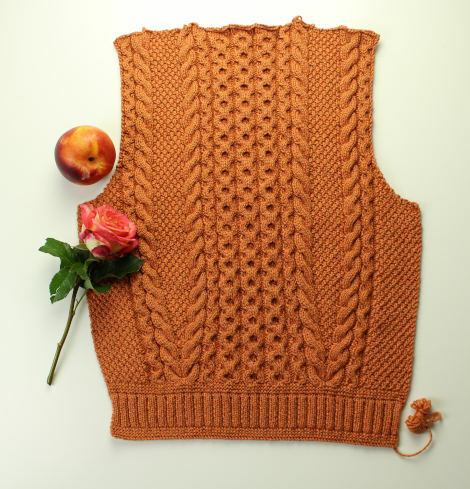 Andrea’s completed the back of this cute little fitted jacket with 3/4 length sleeves. Don’t the cables pop! Andrew wasn’t wearing anything handmade. We really need to knit him some more clothes! Andrea was wearing Jayne during the episode. In the interview with Di she was wearing the Temperate by Kim Hargreaves. Photo of the shrug made for Paul Hardy is copyright Shannon Tofts Photography. Photo of the red dress made for Graeme Black is copyright James McCauley. What a wonderful episode! One of my favorites. It was was inspirational, informative, and humorous at the end. Thank you – love you guys! I so enjoy the podcasts and I’m learning so much! The music, the photos-love it all! So many times I thought to leave a comment for you somewhere, but every time I forgot. 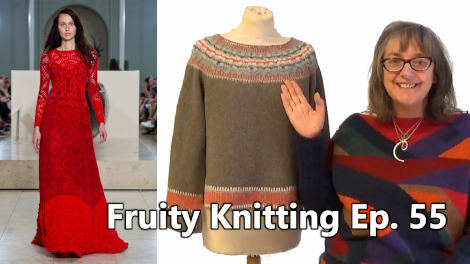 Since a few months now I discovered your unique video knit shows and my-oh-my are they something with a very distinct quality. Ofcourse I had to get used to your characters, because you both are no easy peasy couple, but because of the light atmosphere you both create and at the same time very serious and rigid information, I found myself looking for another Fruity show time and time again. You both were my quite regular guests while in the mean time only now I learned how to knit. Never had the time for it in my very busy life, but Andrea has such a friendly and clear way of explaining the importance of details, finishing, techniques, that only today I tried double handed intarsia for the first time and I love it! Mind you, I knitted and sewed all clothes for my 3 girls when they were young, just learned it myself from ‘magazines’ from wool- or fabric shops. But now for the first time in my 61 yr old life I am really satisfied with what I make. My current little project is a Miffy rabbit for my youngest grandson and I’m so happy I dared to change her ears (inspired by one of your shows with the incredible knit animals designer and because of your so patient explaining of the intarsia technique at the knitted sheep hat tutorial). I see your shows evolve in time, because of your experience and your plans, but you know: the diversity you offer with the lovely walks in beautiful nature, the surprisingly well chosen music each episode, your strictly immaculate background, the laughs, the little ‘mistakes’, the changing chapters each show, the fun and the ‘Prost!’ tradition, and ofcourse your lovely daughter are so spot on. 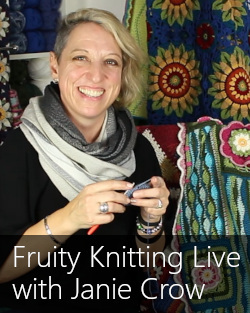 Never could you make a more personal, very professional and dedicated show about where knitting can take you, than right now. Pick your guests and do not worry if you do not have one. Please let the work you have to put in it, not distract you from your fun of making this. And if it does: take a step down and go for a 3 weeks or monthly show. I’ll keep watching. I am absolutely loving the podcast and you have really taught me lots about my own knitting (I have only been knitting for 2 years, but have really advanced in that time). Hi Kerstin. Thanks for pointing that out – I’ve updated the link in the text. You’re knitting development sounds very impressive! Cheers, Andrew.